I'll be honest, until recently I didn't know what affogato was :D I have been seeing it more and more as the weather had gotten hotter and finally looked it up. I thought, this can be done with tea and of course tea affogato was also a thing that people do so I wanted to give it a spin. Tea taste tests are fun because you can compare different flavors all next to each other. I decided to take the jasmine pearls, almond chai and sweet matcha from my sipsby box and pour them over one type of ice cream. 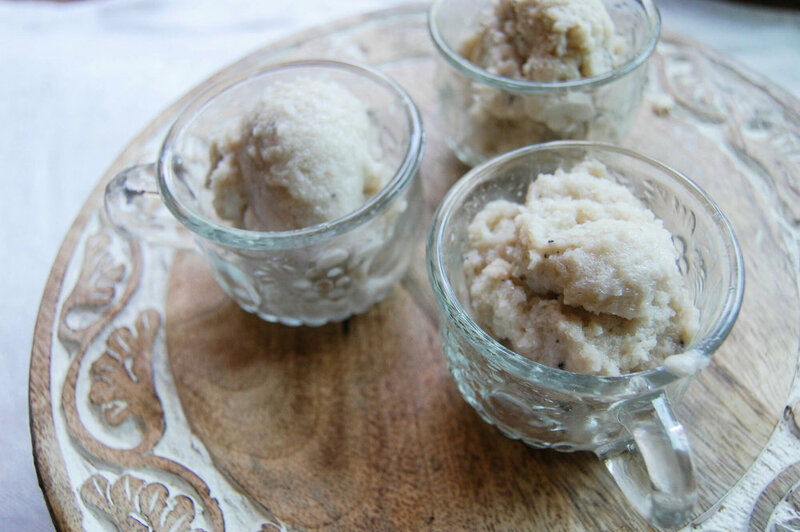 It had been a long time since I made homemade ice cream and wanted to give it another try. 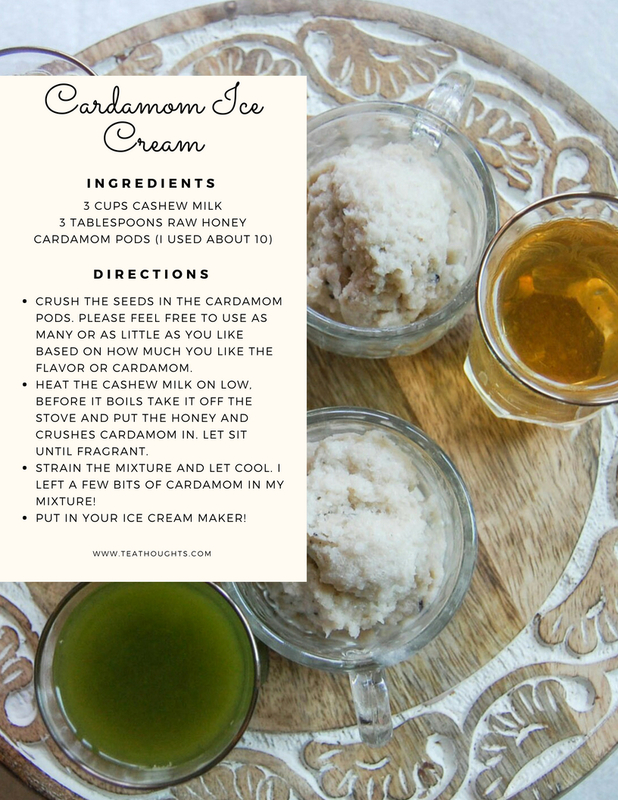 You will see the recipe for cardamom ice cream at the bottom of this post and yay for people who don't eat dairy, it's made with cashew milk! 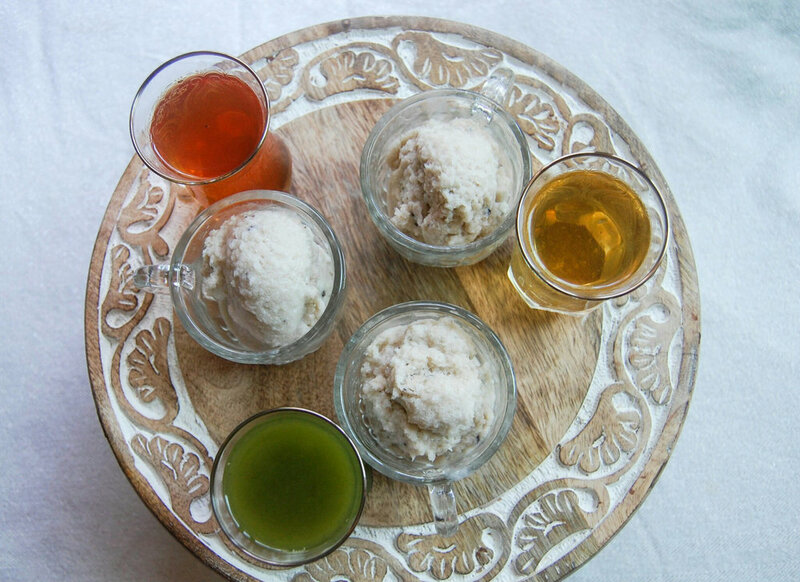 I chose the main flavor of the ice cream to be cardamom because for me, although cardamom has a strong taste it is more or less a neutral ice cream that I think would pair well with any of these teas. I the amount of cardamom I used in my recipe was a lot and the ice cream was very fragrant and lovely! A note about this ice cream. It's not a super creamy ice cream because it doesn't have cream. It's soft but also has more of an icy type texture. 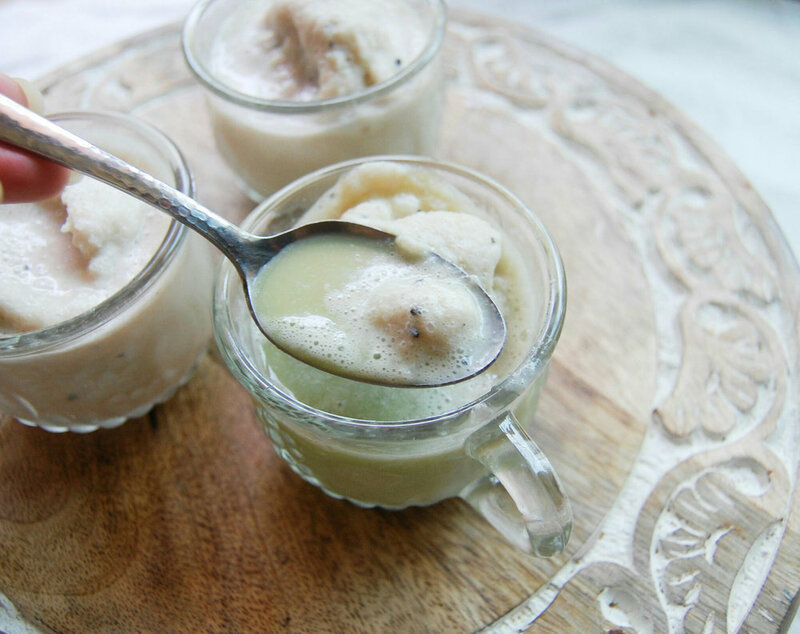 If you are able to find something like coconut cream or if you don't mind dairy any cream will work, adding cream to this recipe will make it more similar to ice cream you buy from the store. Despite the ice cream not being super creamy it's delicious and lower calorie and it worked great for affogato! I was originally concerned that because it wasn't creamy that when I poured the hot tea in it, it would totally melt but that wasn't the case. Yay! The almond chai was my favorite because the nutty flavors of the chai paired so well with the cardamom. The chai was powerful enough to meet the flavor of the cardamom and it was definitely the one I finished first! The two flavors blended very well. The jasmine was 3rd but don't get it wrong, it was still yummy! The reason why this wasn't the top of my list is because generally the aroma of jasmine is so strong it isn't a favorite tea. I have started to enjoy jasmine a lot more but the aroma of the jasmine and the cardamom was too much for me. I will say that the jasmine tea is the combo where you could really taste the full flavor of the jasmine tea once mixed. The other two were a little more lost in the ice cream.